You change your CMS/blogging system and, as a result, the article URL structure is no longer the same. Example: You move from Blogger to Wordpress. Two different discussions need to be merged into one. The migration tools will not migrate comments to a new Disqus shortname, so be sure to use the same shortname on the new site. 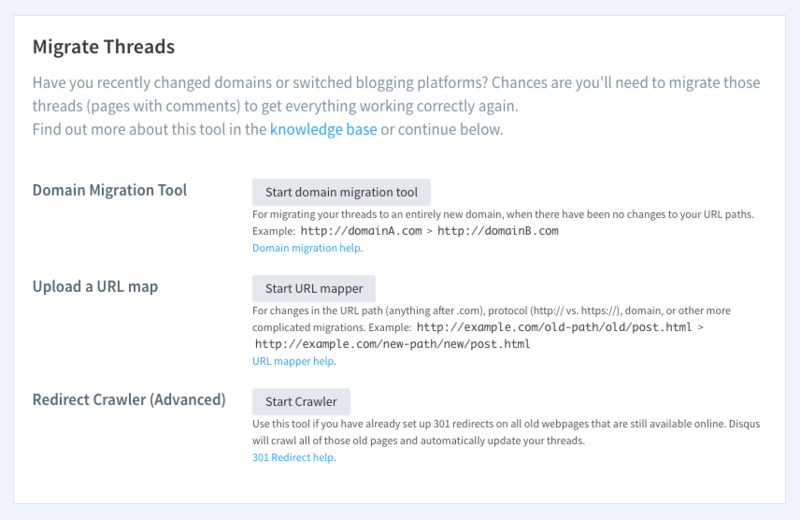 This will ensure that your migrated threads are tied to the correct Disqus account. Migrations can take up to 24 hours to finish. You can check on the migration progress during that time by looking for the updated comment threads on a page where they did not previously exist. If you're using a custom disqus_identifier this will still play a role. If two threads are merged into the same URL and have different identifiers as well, the new thread will contain both identifiers. 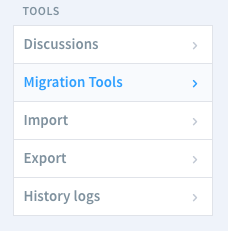 Go to your Disqus Admin and click Tools > Migration Tools (towards the bottom of the navigation panel on the left). Domain Migration Wizard - If the base domain of your website has recently changed, you'll need to migrate the URLs of your commenting threads to use the new base domain (ex: www.old-url.com -> new-awesome-url.com). URL Mapper - If the URL slug of your site's posts has recently changed, you'll need to use our URL Mapper to migrate your commenting threads from the old URL to the new one (ex: yourdomain.com/p=23 -> yourdomain.com/new-page-slug). Redirect Crawler - If you've already set up 301 redirects for your site's pages, then use our Redirect Crawler to crawl your site's pages and migrate the URLs of your commenting threads automatically. Recommended for advanced users only.